Troxel Helmets Home Testimonials Troxel Saves Norah's Noggin! Hi Troxel – just wanted to say thanks for saving my wife’s skull from serious injury. Last Wednesday my wife and daughter went for a short trail ride and a deer spooked the horses. The horses did a 180 and headed for the barn. Norah came off and landed on her head and back. 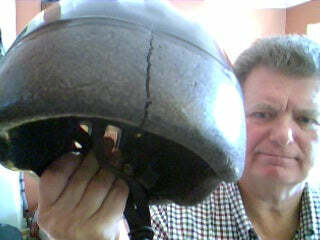 As you can see from the enclosed photo, the Troxel helmet did it’s job and absorbed the impact. Deep crack in the back and side. Norah has sustained soft tissue injuries and a concussion but as a few folks have noted, we could have been planning a funeral. If you don’t want the helmet back, I intend to send it to the local riding establishment to show the kids the value of wearing a proper riding helmet. We will need a new helmet when Norah gets back to riding in a few months and will be looking to get another Troxel.